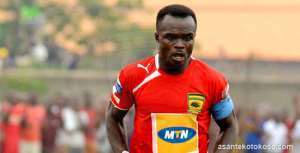 According to multiple reports in the local media, Amos Frimpong is on the verge of losing his captaincy. It is believed that the Dr Keame Kyei led administration is not impressed with the leadership style of the defender. Newly appointed trainer, Paa Kwesi Fabin have been given the nod to appoint a new captain if he wants to. The experienced defender has come under intense pressure after squandering two penalties in the CAF Confederations Cup campaign. Frimpong failed to convert a penalty in the first league of the CAF inter-club competition against CARA at the Baba Yara Sports Stadium. He again failed to score in the second league in Congo in the second league. The Porcupine Warriors were crashed out of the competition after losing 6:7 on penalties.